Donald Trump is a President unlike any of his predecessors. His Presidency has so far been defined by many controversial instances, such as his outburst following the Charlottesville violence where he defended alt-right and Neo-Nazi protesters after a car driven by one of them plowed into a crowd of anti-protesters killing a woman. Carrying Nazi and Confederate flags in our streets and chanting racist songs seemed not to be a problem, but the “alt left” who stood up to these racists, in his eyes were the ones at fault. Of course this speech further divided our nation at a time when we needed unity the most. But of course, these types of outbursts aren’t new for the President as before he even launched his campaign to become President he was on Twitter raging and commenting on political issues, as well as other celebrities and well known people such as Arianna Huffington of the Huffington Post, Katy Perry, and Russell Brand. Yes, it is his Twitter account that most sets him apart from other Presidents, and in this article you are going to be looking at some of the Donald’s finest and most absurd tweets (yes, even the ones that have been since deleted). So, without further adieu, I give you a Top Ten: Trump’s Most Absurd (and in some cases downright mean) Tweets. 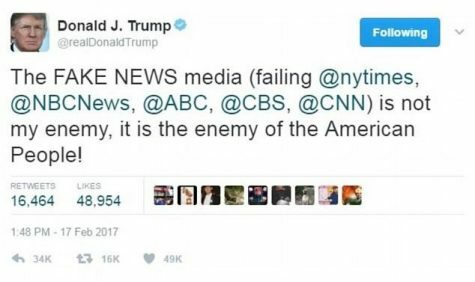 10) Of everything that Donald Trump has attacked during his campaign and Presidency, his so called “Fake News” is one of his top comments, so this tweet is just one example of many similar tweets. This comment is not only absurd because he’s calling one of the most widely known newspapers in the world the “failing” New York Times. Yeah, Donald, tell that to all of its 50.5 Million readers (Reading Tree). However, it is most absurd because this tweet from the leader of the free world draws a harrowing comparison to the fascist leaders of the 20th century who tried, and in some cases succeeded, in discrediting the media, so that they could not be questioned by any source with credibility. 9) It’s one thing to bash Global Warming, which has been proven by NASA (among others) using simple not alternative facts such as rising sea levels, an increase in global temperature, and receding glaciers and snow cover in mountains around the world. I could write a whole paper, and go into much more detail about global warming, but that ’s not what I’m writing about. I digress, not only does Trump deny a clear global phenomenon, but he does it in a manner that makes him sound like a conspiracy theorist on YouTube. Honestly, how does a claim like that get 66,190 Likes? Created by the Chinese to make U.S. manufacturing non-competitive? That sounds like fake news. 8) The idea that vaccines cause autism has been disproven many times. Later, Trump tweeted that he meant that many vaccines at once can cause autism, but taking them slowly over time is fin e. Still that isn’t true. There is no known singular cause of autism, however the most accepted causes by researchers have to do with brain structure (Autism Society). Not to mention, twelve studies have been done on vaccinations and their connection to autism. Every single one has “come up empty” (WebMD). 7) This tweet isn’t the only time Trump calls out “losers and haters” (spoiler alert: another one made the list! ), but what’s so ridiculous about this tweet is that all the tweets on this list, and on his account are exactly why we know his I.Q is NOT one of the highest. 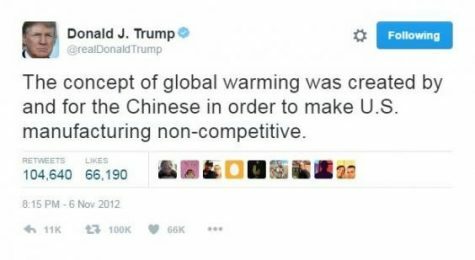 In my opinion, anyone who truly believes global warming is a Chinese hoax is not very smart. 6) This seems like another wild conspiracy. Maybe President Trump should get a YouTube account. This is an odd claim to make out of the b lue, five months after it supposedly happened. 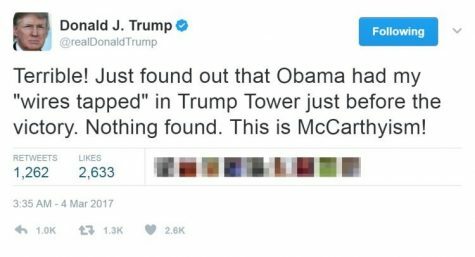 Not to mention, there is no way that Obama could order a wire tapping of Trump Towers, first off he doesn’t have the power to do it on his own, and if he tried it almost definitely would have been leaked. 5) The “haters and losers” are back! However, this time it has a very weird tone. 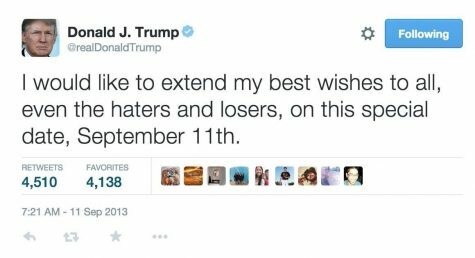 He almost uses September 11th as a way to attack his “haters and losers” in this tweet. If you really want to be sincere about offering your condolences in any circumstance try not to make it about yourself. Also, his wording as far as calling 9/11 a “special date” is a bit odd. When describing 9/11 the words tragic and harrowing com e to mind. The tone of special is one of an exciting day or one we look forward to. Now, I am in no way claiming that Trump supports what happened on 9/11, but what I am saying is that his grasp on the English language seems off. 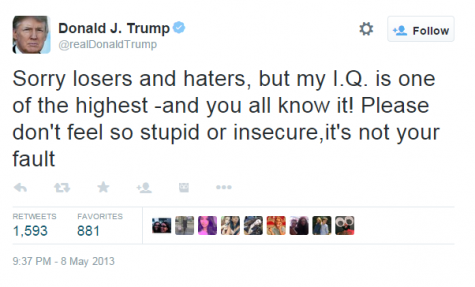 He could have worded this tweet better, maybe his I.Q. isn’t one of the highest after all. 4) Mr. President maybe you should “GET SMART”, and buy an atlas or one of those educational globes that teaches young kids the capitals of countries. 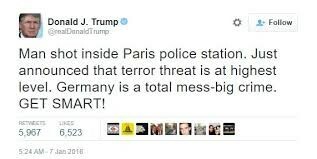 If you did, you would know that Paris happens to be the capital of France, and not neighboring Germany. Also, the wording “total mess-big crime” doesn’t really make much sense. 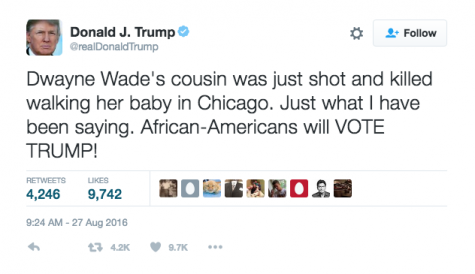 3) Interesting tactic, using a tragedy such as the shooting of a mother walking her baby to try to generate votes. Honestly this is one of the most disgusting things I read, because he doesn’t really care. If he did he would mention that he offered his condolences. Which he did, but in a separate tweet hours late r at around 5 pm, after this tweet got slammed by the media, celebrities, and the entire sports world. Not to mention, why African Americans? Are they the only people in Chicago? Just a racist, disgusting comment. 2) Now, because in Trump’s opinion Obama has done a “terrible” job, no other African American is capable of holding office for “generations”. I’m not going to defend Obama right now, because once again, that is not what I’m writing about. However, when Trump criticizes Bill Clinton for how his presidency went, he never said, you won’t see another white President for generations! As a matter of fact, there have been two since Bill Clinton, so why can’t another black man be President? Trump’s logic is once again flawed, and . . . racist. 1) At long last! 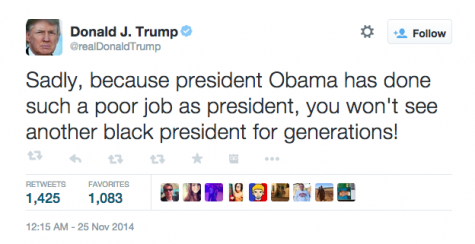 Donald Trump’s most absurd tweet! This one definitely falls under the mean category. What makes this so absurd the question: why was this even necessary? Also, for those of you that don’t know, Arianna Huffington is the co-founder of the Huffington Post. Back to the point, this is a troll tweet plain and simple. I really don’t know what else to say about this, I’m at a lack of words. I don’t get how someone who tweets something like that is sitting at the Oval Office as I’m writing this, and while you’re reading this.